The following is provided to protect the customer from severe personal injury, dismemberment, death, property damage, fire or damage to the compressor. We cannot cover all dangerous situations, thus all users must exercise caution and common sense. All persons working on and operating compressor should only do so after reading this entire manual. 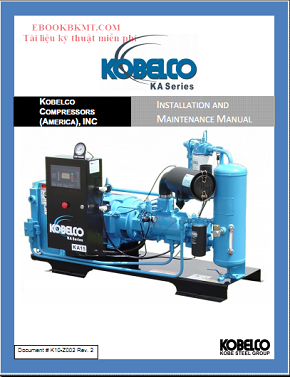 • READ AND UNDERSTAND THE ENTIRE CONTENTS OF THIS MANUAL BEFORE INSTALLING, OPERATING OR MAINTAINING THIS COMPRESSOR. • Never maintenance machine or attempt to remove guards unless the machine is turned off and the power has been locked out. • The compressor is equipped with an automatic start control. Never assume it is safe to start maintenance or remove guards. THE MACHINE MAY START AT ANY TIME. • Inspect compressor daily to insure proper operation. See section 4.1 for more details. • Periodically confirm all safety devices are properly working. Properly trained personnel only must do this. If not done properly severe bodily and property damage could occur. • Never bypass, override, tamper or remove any safety device installed on the machine. • Do not use the air from this compressor for breathing air. THIS UNIT DOES NOT COMPLY WITH OSHA 29 CFR 1910 REGULATIONS. • Do not allow flammable, toxic, or corrosive gasses or dust to enter the air inlet of the compressor or electrical devices. • Never remove, alter or deface any of the warning, danger or caution decals applied to the compressor.